3) The United Kingdom and the Republic of Ireland: 27 January 2000 to 4 March 2000. This was a 115 day world trip mostly staying in hostels. At the time I wrote a paper journal which I have now turned into an electronic copy. The entries are the same as the hard copy except I have added a “Highlights” section at the start. The first leg was beautiful New Zealand and my sister Kara joined Jon and myself for this leg. The thing I recall most a out this trip was the amazing beauty of New Zealand and the highly changeable weather. The Tongario National Park hike I doubt I will ever thought as we had to be ‘rescued’ by the retiree group called ‘Walking for Joy’. The visit to a Maori village although a tourist setup was fun as was the white water rafting at Rotura (plus you never forget the smell). Day 1 – Auckland, New Zealand. Highlights: Start of a 117 world trip covering New Zealand, USA, United Kingdom and Ireland. Shadow animals. Day 2 – Auckland, New Zealand. Highlights: America’s Cup yachts, Ferry ride, Sky Tower, Auckland Museum. Day 3 – Auckland & Bay of Islands, New Zealand. Highlights: Russell and Maiki (Flagstaff Hill). Day 4 – Auckland, Cambridge, Waitomo Caves and Rotorua, New Zealand. Highlights: Glow Worms. Day 5 – Rotorua, New Zealand. Highlights: Hot springs, Tamaki Maori Village. Day 6 – Rotorua, New Zealand. Highlights: White water rafting. Day 7 – Rotorua to Turangi, New Zealand. Highlights: Hot bubbling mud. Day 8 – Turangi, New Zealand. Highlights: Tongario National Park rescue. Day 9 – Turangi to Wellington, New Zealand. Highlights: Snow capped mountains. Day 10 – Wellington, New Zealand. Highlights: Wellington Museum, Cable Car Ride, New Zealand Parliament. Day 11 – Wellington to Picton to Kaikoura, New Zealand. Highlights: Ferry crossing, Scenic train journey. Day 12 – Kaikoura, New Zealand. Highlights: Local Museum. Day 13 – Kaikoura to Christchurch, New Zealand. Highlights: Scenic train trip. Day 14 – Christchurch, New Zealand. Highlights: Christchurch Museum. Day 15 – Christchurch to Auckland, New Zealand. Highlights: Standby flying. Day 16 – Auckland to Honolulu, USA. Highlights: International flight. 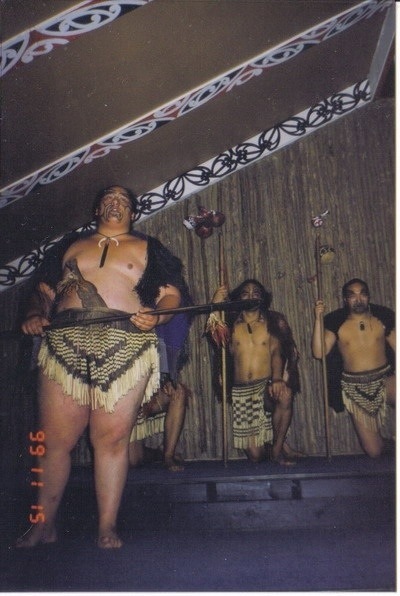 This entry was posted in World Trip 1999-2000 and tagged NewZealand. Bookmark the permalink.